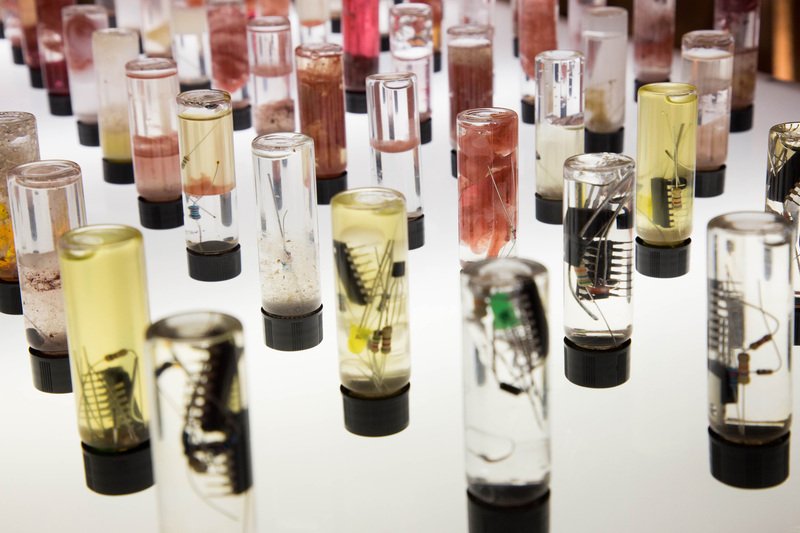 The Nature Lab is closing out its yearlong 80th anniversary celebration with Biodesign: From Inspiration to Integration, a fascinating exhibition on view through September 27 at RISD’s Woods-Gerry Gallery. Co-curated by Co-Works Director David Kim MFA 14 DM and RISD EPSCoR Coordinator Lucia Monge MFA 15 SC in collaboration with emerging biotechnologies expert William Myers, the exhibition showcases 24 projects from makers around the world who incorporate nature into their work in nondestructive, mutually beneficial ways. Alumni Lucia Monge MFA 15 SC and David Kim MFA 14 DM, whose own practices focus on biodesign and art, helped organize the exhibition and symposium. Grad student Angela Torchio MFA 19 GD handled both the identity and exhibition design. 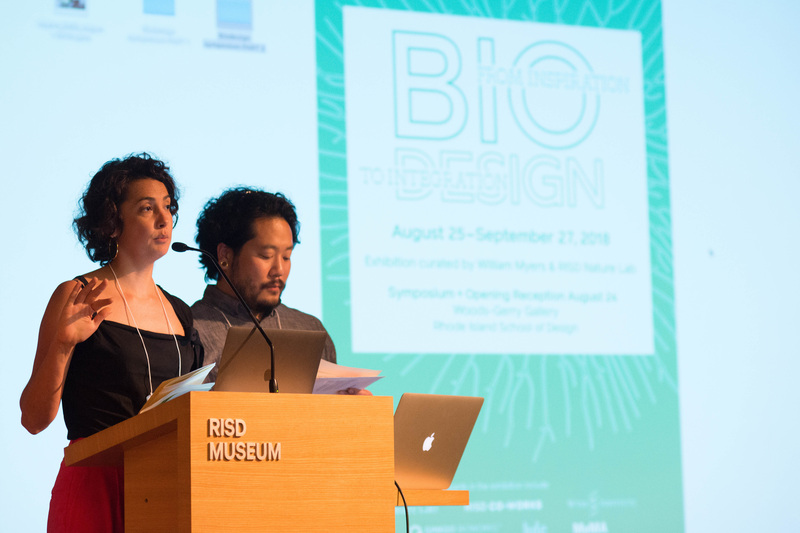 Co-sponsored by the Nature Lab, Co-Works and Campus Exhibitions, Biodesign opened on Friday, August 24 with a half-day symposium in which selected artists spoke about their contributions to the rapidly growing field. In welcoming the audience, Nature Lab Director Neal Overstrom emphasized the need for collaborative, transdisciplinary thinking when solving today’s complex problems. In making the first presentation, Myers spoke about an arguably less critical problem also borne of rapid technological advances combined with little human forethought: drones. He described a program in his home city of Amsterdam in which police officers are using trained eagles to take out drones that are threatening individual rights to privacy. Work by experimental artist Ani Liu explores the social, cultural and emotional implications of emerging technologies. US-based visual/media artist Kathy High also focused on animal-human partnerships in Burial Globes: Rat Models, her 2009 memorial to transgenic lab rats bred to undergo pharmaceutical tests for drugs used on humans. Three of the five rats whose cremated remains were incorporated into her piece—Tara, Star and Matilda—were also part of her 2005 Embracing Animal exhibition at MASS MoCA. By naming the rats and introducing them to the public in this way, she hopes to acknowledge their individuality and commemorate their contributions to medicine. 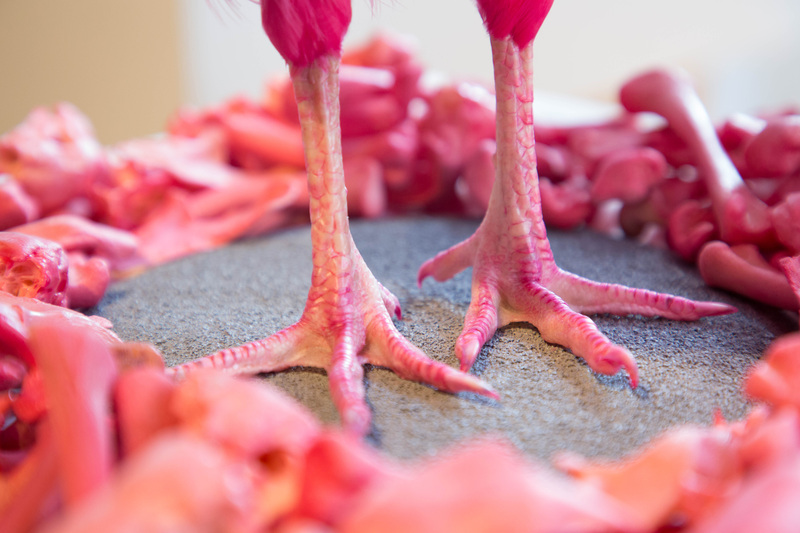 The London-based (Non)human (Non)sense Collective imagines genetically modifying the color of chickens. In addition to humility, the exhibition also highlights the fun and surprises of both artistic and scientific exploration. Serious strategies for building with mushroom-based mycelium bricks (The Living) are balanced with more conceptual and light-hearted projects. Australian computational artist Jon McCormack also toys with the idea of “playing God” with his Fifty Sisters, a series of computer-generated plant forms that are grown algorithmically and incorporate the logos of the world’s largest oil companies. His experiments in “morphogenesis” reveal the computer’s ability to mimic human imagination, he explains, by creating algorithmic designs beyond his own abilities as a designer. 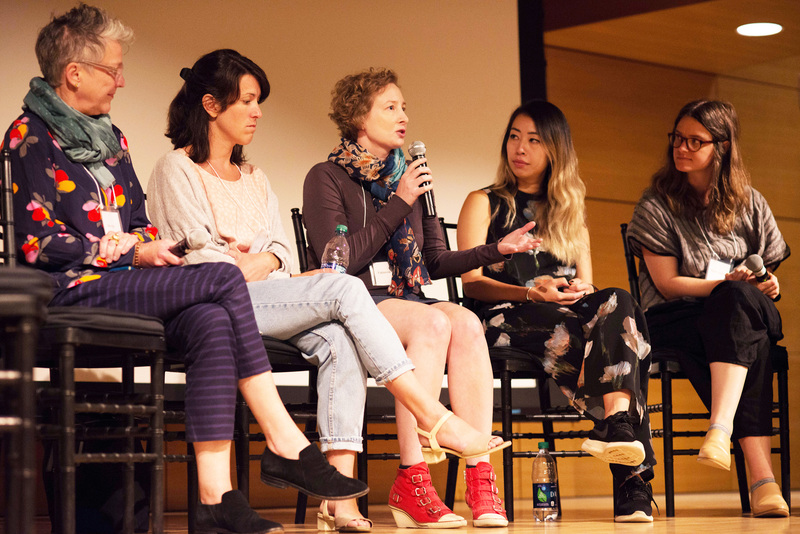 Artists and designers whose work focuses on aspects of nature and biology exchanged ideas at the symposium. And Emma Conley of the Center for Genomic Gastronomy spins the tables entirely by “investigating the human body as a food source for other species.” Her piece To Flavor Our Tears imagines how we might please the palette of a moth species in Thailand known for clinging to human eyelids and drinking our tears. Curatorial assistants Peter Rogers MFA 19 DM and Julia van den Hout also contributed to the success of the exhibition and symposium. A Wintersession ID class challenged students to design biophilic houses measuring in at less than 150 square feet.